Viking Air celebrated the production of its 100th Series 400 Twin Otter in Calgary this past summer, and is showing the aircraft, replete with seaplane floats and executive interior, on the NBAA 2016 static line. The 100th, s.n. 944, is operated as a factory demonstrator by Viking’s sister company, Victoria, B.C.-based Pacific Sky Aviation. Pacific Sky also provides Twin Otter training, in support of which it’s installed a new Level D simulator, also in Calgary. The new unit by Textron-owned TRU Simulation + Training (Montreal) is the first in the world to feature a seaplane configuration, Viking says. Viking holds the type certificates for all out-of-production de Havilland Canada aircraft, from the DHC-1 Chipmunk through the DHC-7 Dash-7 50-passenger STOL regional airliner. The Twin Otter was introduced as the DHC-6 in 1965. Viking acquired the de Havilland type certificates in February 2006. The decision to launch the Series 400, the company says, “was made after a market study, supported by the worldwide Twin Otter operator group, revealed a strong demand for the new platform to replace the aging legacy fleet.” The Series 400 was formally launched in March 2007, and the first production aircraft flew in February 2010. Transport Canada issued the Series 400 type certificate that June. Aircraft have since been delivered in nearly 30 countries. “The Series 400 is an all-new airplane,” says Curtis. 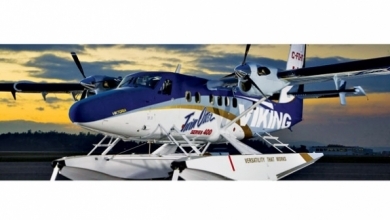 Viking collaborator (and competitor) Ikhana, he notes, continues to convert legacy Twin Otters. Ikhana provides service and support for Viking-built aircraft too, and in fact did the VIP interior for the aircraft on display here today. Viking’s Series 400 Twin Otter is available with standard landing gear, straight or amphibious floats, skis, wheel skis, or IFG/intermediate flotation gear – with multiple quick-change interior configurations available. “The Series 400 Twin Otter is a versatile aircraft that can be utilized for multiple roles, such as regional commuter, environmental monitoring, parachute operations, cargo and infrastructure support, corporate shuttle, and personal use,” the company says. “We build a new Twin Otter every 15 days,” Curtis notes, adding that the current backlog is about 15 months. He says the number flying passengers is difficult to pinpoint, as interiors can be readily changed to suit the mission – an attraction for numerous customers.